With all of this snow and ice, I am so ready for warm weather. 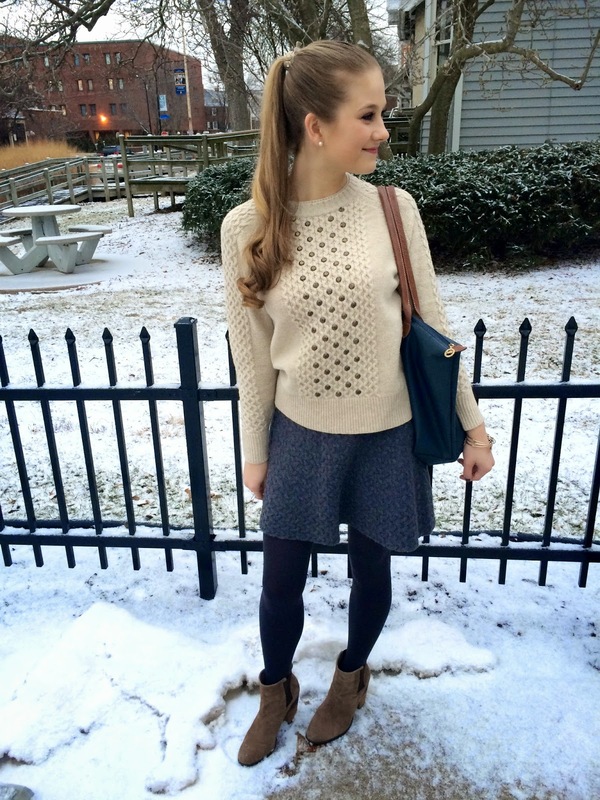 To make a best of things, I chose a look inspired by my Winter Neutrals post. 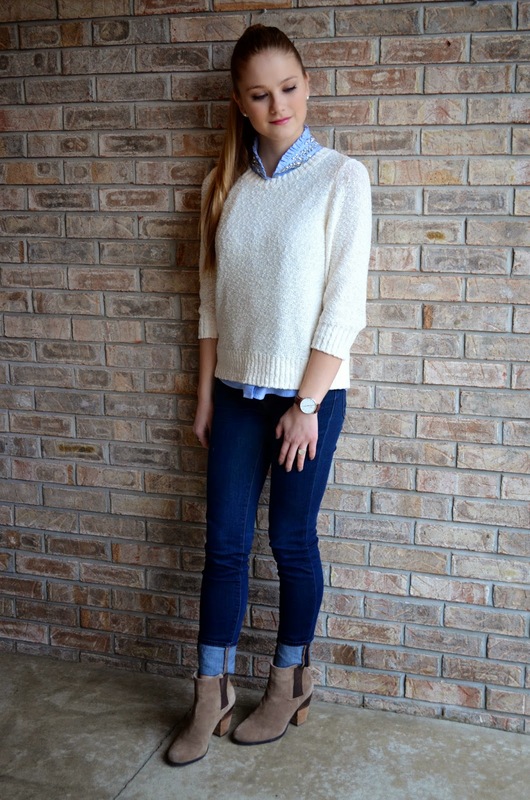 I love that this outfit looks nice for work and class but is also warm and comfy! It's that time again! I am so excited to back at U of I for the spring semester. It is great seeing all of my friends, starting new classes and working at the newspaper again! I just wrote my first story of the semester which you can read here. For this blog post, I am sharing my top nine must-have items for back to school! My New Years Resolution is to drink more water. I hate to admit this but sometimes it will be late in the afternoon and I will realize I did not drink anything that day. I know this is very unhealthy and something I need to change (although if I was lost in the desert with a group of people, I would probably be the last to die of thirst!). My goal is to have at least three bottles of water a day, and I figure this cute water bottle will motivate me to do it! One of my favorite parts of going back to school is going school supply shopping! The website Design Darling has a great selection of fashionable supplies for school, the office and home. This will forever be my favorite bag! It is sturdy enough to hold my laptop and other school stuff but looks great as an every day purse. I have had it for almost three years and despite all the places it has been, it still looks brand new. Mine is a grey-blue color, but right now I am absolutely loving bright blue for the upcoming spring season! These are the BEST notebooks ever! I use them to take notes during all of my interviews for the newspaper and I love that they come in a variety of sizes. The large size is perfect for note-taking and while I usually buy navy notebooks, I am loving the new 'Orchid Purple' color! I am in the Delta Gamma sorority so these nautical sheets are great (and who doesn't love anchors?). Since I am a car-less college student, I know it is important to keep an umbrella on hand, and Lilly Pulitzer's colorful patterns can brighten up any dreary day. If you have teachers like mine who do not allow electronics in the classroom, be sure to add a watch to your shopping list. My Daniel Wellington watch is one of my favorite purchases because of its simple design that goes with every outfit. I am obsessed with this desk organizer, also from Design Darling. It has such a fun pattern and will help me stay organized this semester. I recently bought a pair of L.L. Bean Boots and I am not sure how I survived without them before! They are perfect for rainy days and trudging through snow. What are your must-have items for school? Hope everyone is having a great Saturday! I spent the day in St. Louis with my family and we discovered a great Mexican restaurant called Hacienda - definitely worth a try if you live in the area. It was also almost 60 degrees today which made shooting these pictures much more pleasant. This is one of my favorite winter looks. In my opinion you can never own too much plaid, so naturally when I found this Forever 21 plaid dress I was very excited! 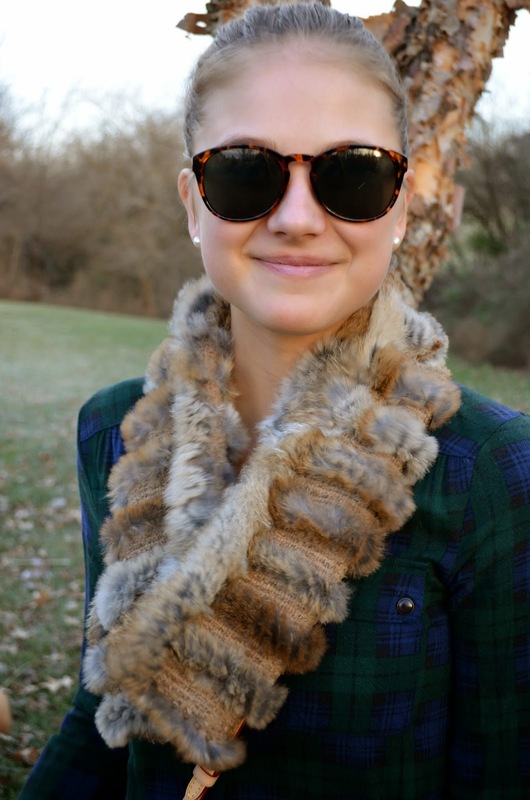 I added my fur scarf and other brown accessories for a daytime look. After multiple lazy days in my pajamas watching movies (gotta love winter break! ), my mom got me out of the house to do a little shopping. I decided to wear my new leather skirt! Since I describe my style as preppy and classic, I usually stay away from black leather but I thought the shape of this skirt made it more ladylike, especially when it is paired with a simple blouse and suede boots. Did I mention it is only $34.99 at American Eagle? With an average temperature of 30 degrees, a few snow and ice storms under my belt, and no car on my college campus, I have definitely learned how to dress warmly this winter season. Every day I reach for the same cozy sweaters, thick scarves and boots. However, I can't help but feel that my repetitive outfits are becoming as seasonally depressed as me. To fix this, I decided to take a cream sweater I often wear to class and pair it with one of my favorite J.Crew blouses from the summer. 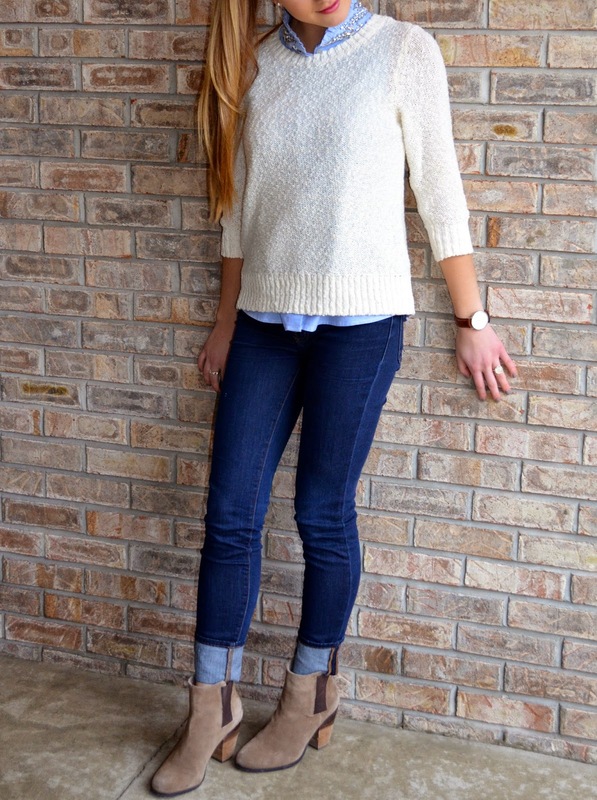 The powder blue color and rhinestones are the perfect accent and make my tired sweater seem new and fun again. A similar look can be created by wearing a sparkly necklace!